I’m not an avid consumer of mint related confectionaries or mash-ups of chocolate and mint, especially chocolate chip-mint ice cream. The combination is not bad but definitely not great. The pharmacy green-hued chocolate chip-mint ice cream was also a big turnoff whenever I hit up ice cream shops in the younger days. However during this holiday season I ran into a sweet treat that actually inspired me to make mint ice cream. That would be Trader Joe’s Candy Cane Joe Joe’s. These candy cane-studded filled oreo knockoffs were calling out to me to be crushed into ice cream like an oreo mcflurry. Last time I had that was about eight years ago (scary!) 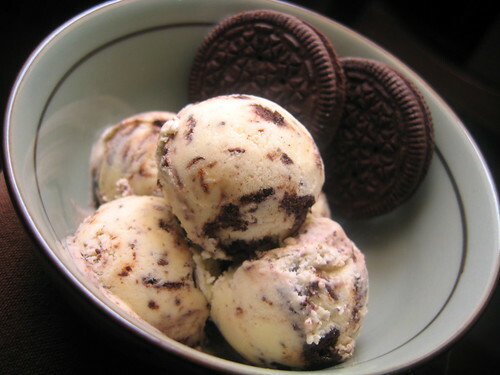 and I remember how good the oreo chunks and bits were in the soft ice cream. The only problem was that there wasn’t enough oreos in the mix. There would be none of that nonsense in my version. And since I surprisingly found these minty Joes Joe’s rather enjoyable I ran with it and decided to make a mint flavored ice cream. At least if I still wasn’t feelin the mint ice cream deal I knew Boy would be there to finish the pint since chocolate chip-mint is one of his favorite ice cream flavors. But the ice cream turned out rather delicious – creamy, generously cookie studded and refreshingly minty. And most definitely not green. I added some dark chocolate chips in there too. Best served with the Candy Cane Joe Joe’s on the side for some extra oomph. i am not a fan of either cookies n cream nor chocolate mint chip ice cream, but damn, i’d eat that. knew you would like it. i’m not a fan of cookies n cream either – ice cream and chocolate bars alike. but i think i’ll try making ice cream with the other joe joes and adding bigger chunks of cookies next time. i’m an add-in girl i suppose. i am a huge cookie dough ice cream fan! they’re always a tad too sweet for me though. i’ll have to work on a home version or something. Y’all are all crazy in the head. Mint chocolate chip ice cream is my favorite! My grandma used to take me to Friendly’s (do they have those outside of the east coast?) and I would always get that green stuff. Now I stick to Haagen Daaz, which is white. Point is, I would be all over that ice cream! oreos with colored filling?? lol, it’s already so artificial inside..
i wish you tried some! 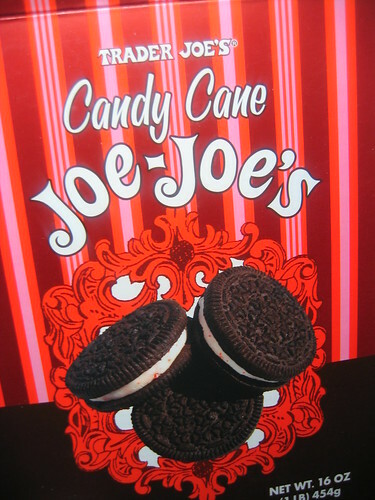 i still have a fresh box of candy cane joe joe’s. so you never know, another pint might pop up sometime. Mint chocolate chip ice cream is my favorite too! East coaster unite! Holler! Hi!. Thanks for the blog. I’ve been digging around for info, but there is so much out there. Google lead me here – good for you i guess! Keep up the good work. I will be popping back over in a few days to see if there is any more info. I enjoyed your blog, come check out mine sometime.